12% Rabatt - jetzt in unserem Dawanda Shop! 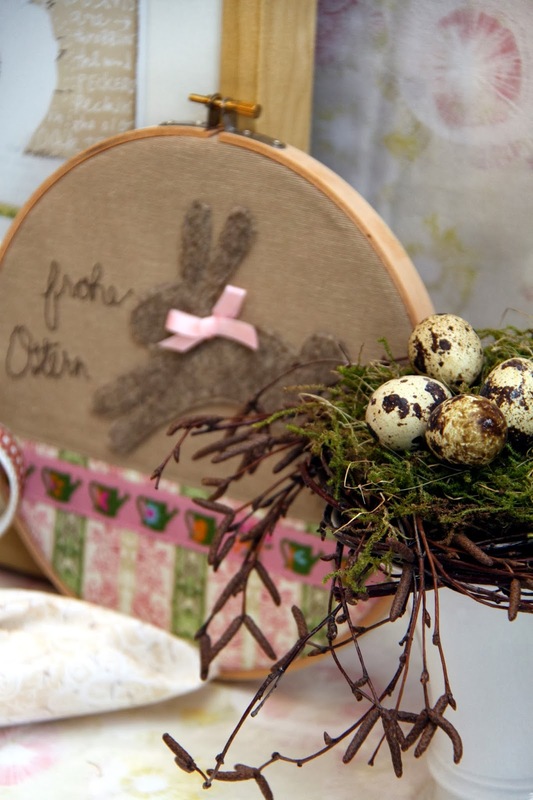 Das Special findet von Donnerstag, den 27.03.2014 bis Sonntag, den 06.04.2014 statt. Jeden Tag werden unterschiedliche DaWanda-Hauptkategorien beworben. 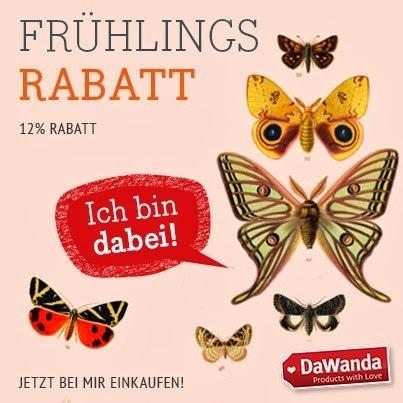 12% discount - now in our Dawanda shop! From Thursday March 27th to Sunday April 6th. Every day different categories on sale! Without a doubt, springtime really is my favorite time of year. Spring green is my favorite shade of my favorite color, and I love all those first signs of life that sneak out of the greys and drabs that winter left behind. So, it would only be fitting for me to be in full swing with spring projects. I've been working with two quilting techniques a lot lately in non-quilting projects, and I just can't seem to get enough... the first is free motion quilting, and the other I'll show you later. 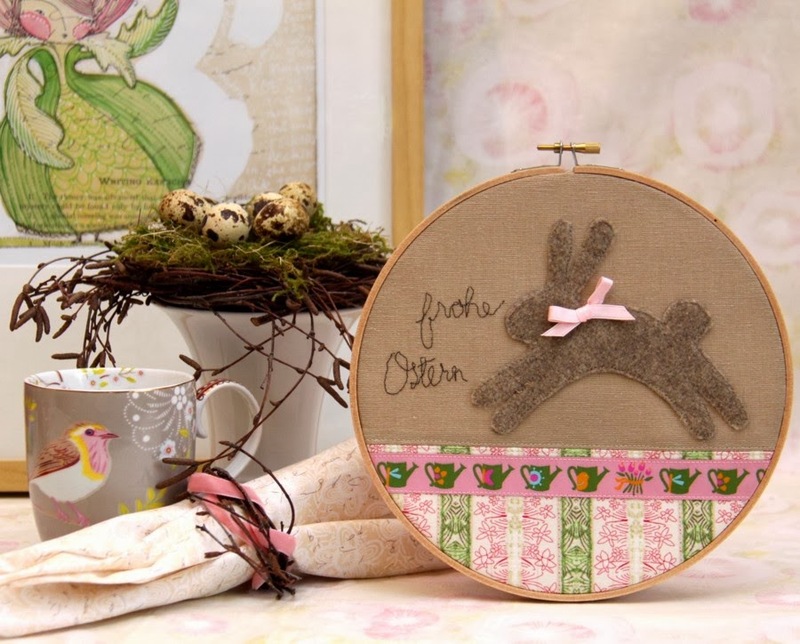 If you've been with me for a while, you may remember this friendly little rabbit from my "Hippity-Hop" projects... so, here he is again, restyled using fresh new fabrics and my "Freshly Watered" ribbon, all in a cute embroidery hoop that can be used so many places. 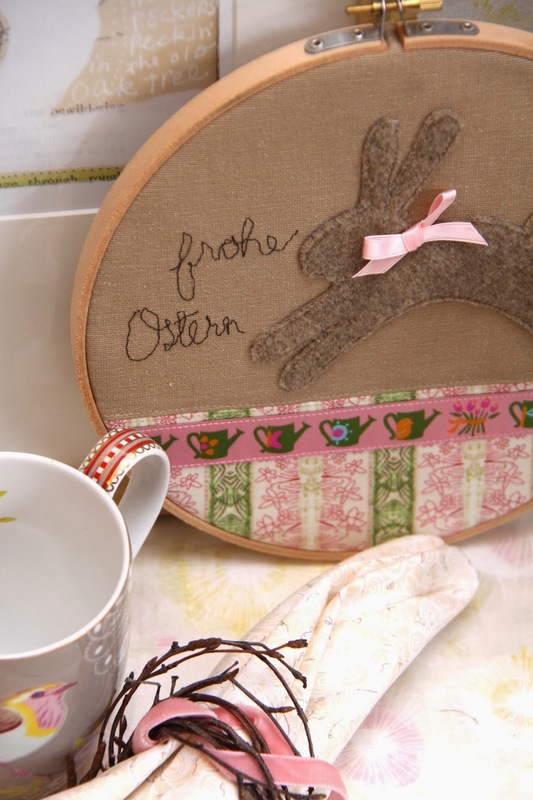 For my English readers, "frohe Ostern" is "Happy Easter" in German... enjoy! 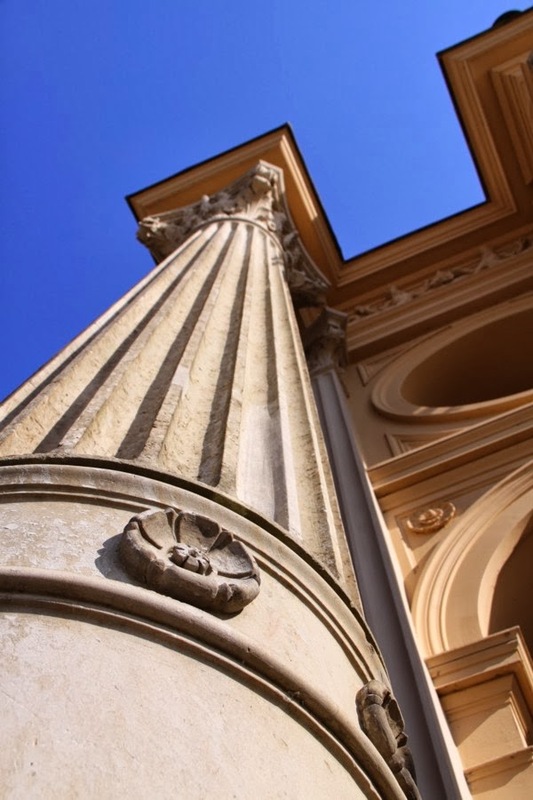 Other than the obvious backdrop of old architecture, differences in houses, and landscape, the differences are not as blaring as one might expect. But they are there and they are subtle. With Flip Side of the Pond Friday, I simply want to share an outsider's viewpoint of those small little details that make me realize that this is not the place that I grew up calling home. I'd love it if you join in with your own stories. I can still vividly remember the very first trip that I ever made to Germany. My then future husband had made arrangements for various mini-trips, events, and meeting family and friends during my short stay. I can remember one visit with his friends, while still being greeted at the door, we were kindly asked to remove our shoes. Normally I would have been more than happy to oblige them on their kind request, except for the fact that for this trip I had severely under packed and even worse underestimated the weather, thinking in terms of the already spring and summer-like weather I had just left back in sunny North Carolina. I remember not only having cold feet the entire night, but that I had to sit on them the whole evening just to keep them warm. At first, I just chalked the incident up to the fact that perhaps they were just overly protective about their newly installed wooden floors. But the longer I've lived here, the more encounters I've had with people asking me to take my shoes off upon arrival. Sure, if they are super muddy, soaking wet, or just plain full of dirt it's obvious to me, but this is almost a phenomenon that I had never experienced before. At my son's kindergarten, greeting all visitors at the front door, one finds oversized, giant wool slippers that might appear to have been left behind by some Jack-and-the-Beanstalk character. For the non-native, they look quite odd. But what one is actually supposed to do with them, is slip them over your existing shoes, and glide from room to room so as not to track dirt throughout the whole building. Any German reading this would probably think, ummm, yeah, sounds logical, so what's the big deal? I suppose it's not really a big deal unless you've never seen anything like this before. I completely understand the logic behind this, but nonetheless it is a spectacle which would leave most Americans not quite knowing what to say. But since living here, I have learned that while in Rome, do as the Romans do... packing your house shoes/slippers for everywhere you visit is a MUST - friends homes, any children's activities found in a gym, and even church! As with most comparisons... no wrongs, no rights... just different. Any stories from your side of the pond?